After posting the single-largest monthly decline since 2008 in December, The Institute for Supply Management’s Purchasing Managers’ Index (PMI) registered a 2.3 point gain in January reaching 56.6 percent. The Production Index rose 6.4 percent to a five month high of 54.1 percent. After falling more than 10.5 points in December, the New Orders Index rose 6.9 points to reach 58.2 percent. The Export Orders Index fell 1.0 point to its lowest level in more than two years at 51.8 percent. Image 1. Stock indices from Feb. 1, 2018 to Jan. 31, 2019. Local currency converted to USD using historical spot rates. The JKC Pump and Valve Stock Indices include a select list of publicly traded companies involved in the pump and valve industries, weighted by market capitalization. Source: Capital IQ and JKC research. The U.S. economy gained 304,000 new jobs in January, almost twice as high as economists’ expectations. December’s employment numbers were revised sharply down as only 222,000 workers were added in the final month of the year, down 90,000 from initial reports. The trend remains at an average of 241,000 jobs added per month over the past three months. In January, construction added 52,000 workers, while the manufacturing sector added 13,000 workers, the smallest amount since August. December’s manufacturing employment was reduced by 12,000 jobs. U.S. factory orders declined 0.6 percent in November, the second straight monthly decline. Durable goods orders increased 0.7 percent, a recovery from the 4.3 percent decline in October. 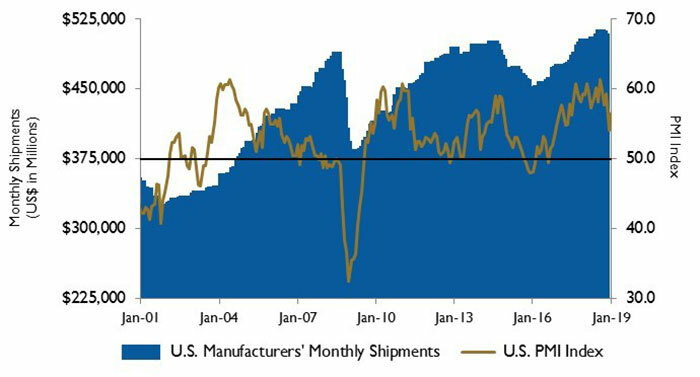 Shipments of nondefense capital goods, excluding aircraft, fell in November, the third decline in the past four months. 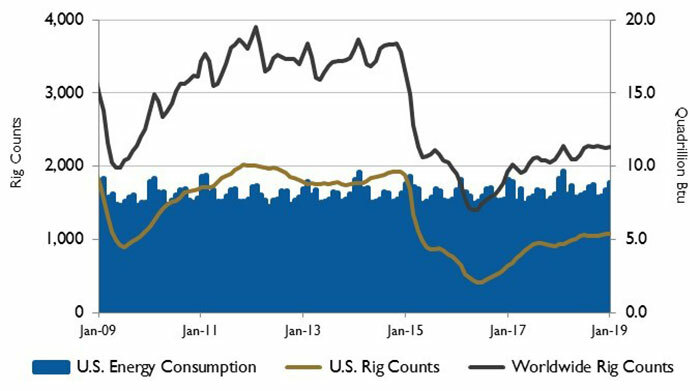 In its new Annual Energy Outlook 2019, the U.S. Energy Information Administration projects that for the first time since the 1950s, the U.S. will export more energy than it imports by 2020 as increases in crude oil, natural gas and natural gas plant liquids production outpace growth in U.S. energy consumption. The changes in net energy trade are driven by evolving trade flows of liquid fuels and natural gas. The U.S., a net exporter of coal and coke for decades, began exporting more natural gas than it imports in 2017, and is projected to export more petroleum and other liquids than it imports within the decade. As natural gas demand grows in Asia and U.S. natural gas prices remain competitive, U.S. natural gas trade will be increasingly dominated by liquefied natural gas (LNG) exports to Asia and other destinations. On Wall Street, the stock market rebounded in January with the Dow Jones Industrial Average rising 7.2 percent, the S&P 500 Index gained 7.9 percent, while the NASDAQ Composite gained 9.7 percent. Better than expected fourth quarter earnings and the temporary end to the partial government shutdown fueled the markets, along with stable oil prices and positive developments on the trade war with China.